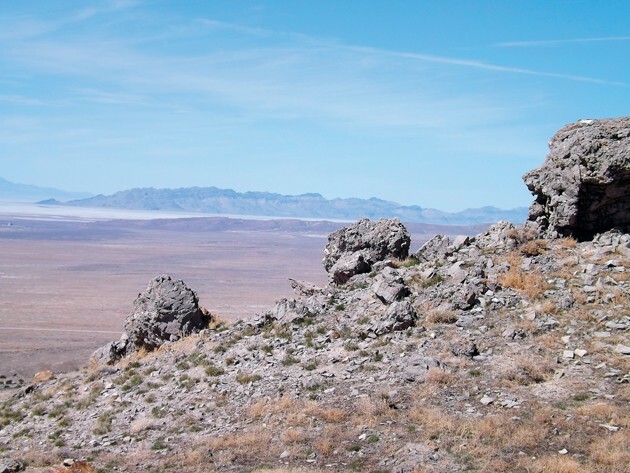 Atop the Grassy Mountains, the Great Salt Lake Desert comes into full view, with Nevada far on the horizon. I went for a hike in the Grassy Mountains last week. Due to an ankle injury, my pace was slowed. But it helped me to take a closer look at the desert terrain’s peculiarities. 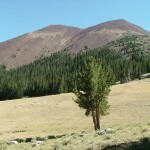 I began my hike just east of the summit of a low pass in the southern Grassy Mountains near an old corral. On my approach to the pass, I noticed a castle-type rock formation and aimed my efforts there. It was a sunny day, but the temperature was 40 degrees and the wind made it chilly. The draws and fenceline of the old corral were piled and choked with Russian Thistle, commonly referred to as tumbleweed. Everyone loves the Old West movie scene where two gunfighters are squaring off at high noon on a deserted street when a tumbleweed, driven by the wind, rolls between them. Tumbleweeds, driven across the desert valleys by the wind, pile high and deep in ravines, along fence lines and anything else they can latch onto with their skeletal, spiny, prickly arms. Pronghorns, Desert Bighorn and a few rodents enjoy the young plant shoots, but in my opinion, they are good only for burning. I have seen them totally obstruct a desert road for a quarter mile, piled five feet high. As I continued on my hike, I noticed the usual desert things like sagebrush, harvester (red) ant pyramids, green lichens on ancient rocks and birdsong in the junipers — disrupted by an occasional raven caw. I hiked through an arroyo over to the castle rock, which when viewed from the west, looked like an Indian chief screaming at the sky. If the old warriors could see what has been done to the land, and how the majority of their people have disappeared, they would let out a mournful cry. The rock is about 20 feet high and is a good place from which to observe Puddle Valley and the Lakeside Mountains to the east. I had intended to only reach the rock, but when I get out in the desert, I always have to see what is over the next hill. I tightened my boot to give my ankle more support and picked my way up a rockslide, following the edge of a mountain rim to the west. Along the way, I walked onto a faint ghost of a road that was barely discernible. I followed it to a patch of grass in junipers just below the rim next to the rockslide. The exposed rocks consisted of large, rounded cobbles seemly stacked to prevent them from tumbling down. I climbed into the middle of the rockslide, found a flat rock upon which to sit, and ate my lunch next to a respectable rat nest. I could see straight through Low Pass, which is the gap between the Cedar and Lakeside mountains, and through which Interstate 80 passes. Beyond Low Pass, the Stansbury, Oquirrh and snowy Wasatch mountains were visible. The wind calmed and it was warm there in the rocks. I saw a large jackrabbit in the boulders, who froze when he saw me. He sat there for a few moments and then disappeared. It was peaceful, soaking up the desert afternoon sun, but there was more to see. 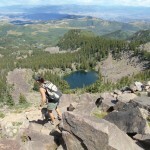 I ascended the rockslide to the top of the ridge and then followed the crest to the top of a rocky knoll. From this knoll, I could see nearly all of the Great Salt Lake Desert. Pilot Peak stood out boldly on the horizon across the salt. The air was so clear, I could see the Toano Range and even the snow-capped Schell Creek and Cherry Creek mountains deep into Nevada. I checked my backpack and realized with disappointment that I forgot my copy of Charles Kelly’s book “Salt Desert Trails – A history of the Hastings Cutoff.” I had planned to find such a place where I could survey the desert and study the book. Along the base of a limestone cap, I found a vein of pure white quartz and pocketed a few specimens. I noticed one large, solitary and nearly perfectly rounded boulder that was covered with orange, yellow, green and white lichens. It almost looked like an oversized Easter egg. A raven flew by and it was so silent I could hear the swoosh, swoosh of its wings. I noticed a jumble of flat, black rocks to the south and hobbled down to them. I was disappointed because there were no petroglyphs or arrow points. If there had been, I would have only admired them — and left them there. I had covered about two miles and started to make my way back to my truck. I walked across the rim and rejoined the ghost road. I found old, thick pieces of aquamarine-colored glass, a rusted barbed wire latch, and cans that were oxidized to the point they crumbled to the touch. It could have been an old camp. I wondered if some cowboy sat here and ate a jar of pickled eggs 70 years ago and saw a similar scene. I picked my way across a bench through several sandy arroyos. I avoided several badger and snake holes and eventually arrived at my truck. 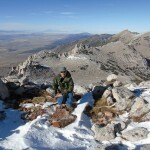 If you venture out in this area, you will find solitude and great views. To get to the Grassy Mountains and Puddle Valley, follow I-80 west past Delle and then take exit #62, which reads “Lakeside/Military Area.” Head north and as the paved road bends west around the mountain, take the dirt road that breaks off directly west. 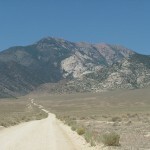 Follow this road across Puddle Valley and it will take you to the low pass in the southern Grassy Mountains where you will see the old corral. Caution: Travel backcountry roads and hike in the desert at your own risk. If you venture into these areas, you must have a good map, plenty of water, fuel and a spare tire. Inquire about road conditions from the Bureau of Land Management – Salt Lake District Office at 801-977-4300. Always tell someone where you are going. Cell phones don’t work in many parts of the desert, so be prepared. Maps: USGS 1:24,000 “Ripple Valley” and “Low” quadrangles. US Geological Survey 1:100,000 “Tooele” and “Bonneville Salt Flats” maps.